Here is a picture of my working studio... which is very conveniently located here on our 5 acre property in Dripping Springs, Texas... so my commute to work is just a short walk from my the back door our house... which is really wonderful... I feel very fortunate. HIPPOS EATING ALLIGATORS, COME FROM ? ! ? ! I get this question often... so here is the very long and I'm sorry to say... not terribly exciting story. I came up with Hippos Eating Alligators when I was 18 or so. I was making earrings out of shrinky dinks (remember those?)... and selling them in Austin, TX. One of my favorite designs was a hippo attacking an alligator. This design was inspired by a show I saw on TV (probably National Geographic) where a hippo attacked what I thought was an alligator. I had no idea that hippos were so aggressive... I thought hippos were quiet and even nice... I mean they are vegetarians after all... why would they attack another animal?! Hee hee! Well, when I needed to come up with a company name... I thought Hippos Eating Alligators was PERFECT! Perhaps I felt the need to spread the word that hippos are not nice animals - beware! Honestly, it was a long time ago, I can't for the life of me remember why I thought it was such a great idea... which is kind of funny... ahh to be young and silly! and well the name just stuck... almost 30 years now! The best part is oddly enough it's a name that people seem to remember... so this crazy name... has been wonderful for my little business! AS SEEN ON TV! 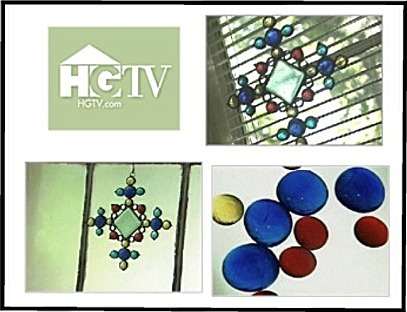 HGTV's Crafter's Coast to Coast!